In 1882, the Marchioness of Bute founded an orphanage for Roman Catholic children. It occupied a property known as Bellevue House, on Barone Road, Rothesay, which had originally formed part of the Rothesay Cotton Works. The establishment was run by Sisters of the Society of the Sacred Heart and initially housed up to sixteen girls. The orphanage site is shown on the 1896 map below. 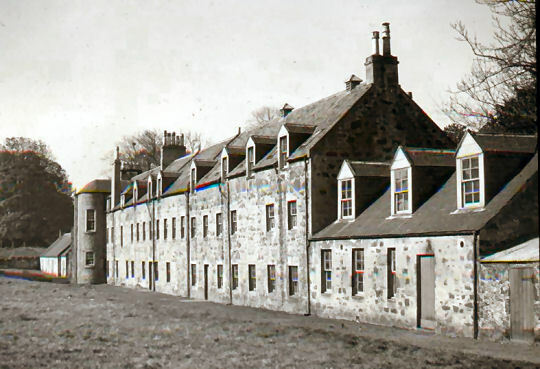 Former Roman Catholic Orphanage from the north-east, Rothesay. Subsequently, the accommodation was considerably enlarged. In 1901, the orphanage had a staff of seven sisters. The inmates included 79 girls, 37 of whom aged 14 to 24 were occupied as 'stocking knitters'; the remaining 42, aged 5 to 15, were listed as 'scholars'. There were now also 44 boys aged 4 to 16, all of whom were listed as 'scholars'. In 1911, there were still 7 sisters, and 90 girls, but boys no longer formed part of the establishment. In 1930, the Society of the Scared Heart decided to concentrate its activities in the south of England and the Rothesay orphanage was closed. The property is now occupied by the Bute Fabrics company. Thanks to Neil Bowie for information on the orphanage.